Forget the hunt for Edvard Munch’s The Scream – Hampshire art fans have a theft much closer to home to worry about. While a nation-wide hunt continued in Norway today to recover one of the world’s most famous paintings, police in Southampton were investigating the theft of a lesser-known portrait. The sketch, entitled Destroy and Diminish (mine to), is an unusual self-portrait by Southampton born artist Sarah Misselbrook. It had gone on display earlier this month as part of a prestigious arts project, which has breathed new life into Southampton’s medieval vaults. 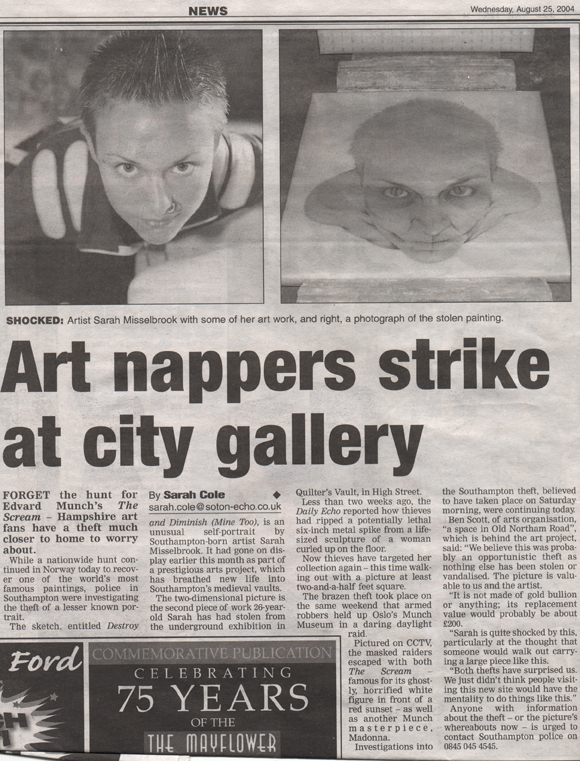 The two-dimensional picture is the second piece of work 26-year-old Sarah has had stolen from the underground exhibition in Quilter’s Vault, in High Street. Less than two weeks ago, the Daily Echo reported how thieves had ripped a potentially lethal six-inch metal spike from a life-sized sculpture of a woman curled up on the floor. Now thieves have targeted her collection again – this time walking out with a picture at least two-and-a-half feet square. The brazen theft took place on the same weekend that armed robbers held up Oslo’s Munch Museum in a daring daylight raid. Pictured on CCTV, the masked raiders escaped with both The Scream – famous for its ghostly, horrified white figure in front of a red sunset – as well as another Munch masterpiece, Madonna. Investigations into the Southampton theft, believed to have taken place on Saturday morning, were continuing today. Ben Scott, of arts organisation, ‘a space in Old Northam Road’ which is behind the art project, said: ‘We believe this was probably an opportunistic theft as nothing else has been stolen or vandalised. The picture is valuable to us and the artist. ‘It is not made of gold bullion or anything; its replacement value would probably be about £200. ‘Sarah is quite shocked by this, particularly at the thought that someone would walk out carrying a large piece like this.